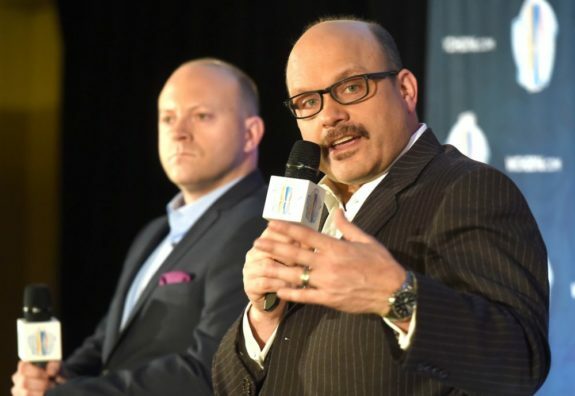 The NHL Trade Deadline is just around the corner, and Edmonton Oilers general manager Peter Chiarelli will be working the phones to get this team back on track. Saying the 2017-18 season has been a disappointment is an understatement. The question now is where does this team go from here? 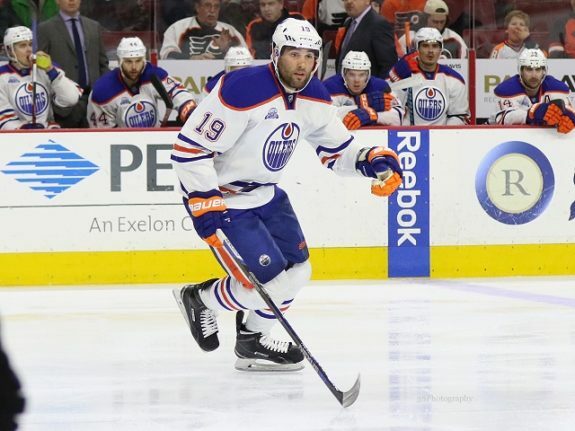 Patrick Maroon has an uncertain future, and we’ll know his fate by the deadline. Will he be traded, or will the Oilers sign him to an extension? Of all the pending unrestricted free agents (UFA) on the Oilers roster, Maroon carries the highest value. Next would be Mark Letestu who looks to be as good as gone. Several teams are interested in the fourth-line center. Then there’s Mike Cammalleri, Yohann Auvitu and Laurent Brossoit. Brossoit, 24, is a restricted free agent (RFA) this summer, but his future in Edmonton is bleak at best. Will the Oilers cut bait with Brossoit at the deadline? Regardless, here is your Oilers trade deadline primer, and all the rumors and headlines leading up to the big day. Pending UFA’s: Yohann Auvitu, Mike Cammalleri, Mark Fayne, Grayson Downing, Brian Ferlin, Keegan Lowe, Joey LaLeggia, Mark Letestu, Patrick Maroon, Ty Rattie, and Dillon Simpson. Pending RFA’s: Matt Benning, Ben Betker, Laurent Brossoit, Drake Caggiula, Braden Christoffer, Brandon Davidson, Nick Ellis, Kyle Platzer, Darnell Nurse, Iiro Pakarinen, Patrick Russell, Anton Slepyshev, and Ryan Strome. Needs: No. 1 NHL defenseman, first-line goal scorer, top-nine forward, NHL backup goalie, defense depth. Chiarelli was very short and to the point in his recent media availability leading up to the deadline. It’s clear the team didn’t live up to expectations, and now it’s time to reevaluate the current group. Chiarelli admitted, without outright naming any players, that the team is talking about moving their pending UFAs. Edmonton needs to get faster and Chiarelli’s looking for prospects in return as opposed to picks. If that means anything about the futures of Maroon and Letestu, it’s a hint at what Chiarelli could be looking for in a trade. It sounds like a majority of the work will come in the off-season. For fans looking for a major shakeup and yard sale at the deadline from Edmonton, don’t count on it. Chiarelli is also looking at options to improve the team without blowing it up. We’re not going to blow it up. If that’s the definition of re-modeling, then no. There are some areas we need to tweak. I’ve always felt the margins (of error) are very small in this league. If you’re not within the margins you end up where we are. If you want another rebuild, it’s not happening, nor should it. It’s obvious you can’t do that when you have Connor McDavid and Leon Draisaitl signed long-term through the prime years of their careers. You can’t waste those years and Chiarelli is aware of the urgency that’s needed to turn this around. So where does this leave us? Letestu is expecting to be moved at the deadline. A lot of teams are reportedly showing interest in the 33-year-old who will be a cheap option with a $1.8 million cap hit. He has had his fair share of lulls this season and has eight goals and 18 points in 59 games. He’s coming off a career year that saw him score 16 goals and 35 points in 78 games. Much of Letestu’s decline this season comes hand in hand with the Oilers struggling power play. Last year 11 of Letestu’s 16 goals came from the power play. This year Letestu has just three PP goals. There’s still plenty of interest, mainly due to his penalty killing (PK) and faceoff abilities. Letestu is operating at 53.4% on faceoffs this season which is above his career average of 52.1%. THW’s Larry Fisher believes the Columbus Blue Jackets, Los Angeles Kings and Pittsburgh Penguins are all potential suitors for Letestu. Pittsburgh also has five picks between the fourth and seventh round of the draft at their disposal. If Edmonton’s goal is to get a third-round pick, Columbus might be an option. Los Angeles also has a stockpile of picks with five picks between the third and sixth round. Los Angeles has two fourth-round picks. Reid Wilkins from Edmonton’s 630 CHED radio confirmed the Toronto Maple Leafs are interested and have called Chiarelli about Letestu. Toronto is looking, like the other teams mentioned above, for a bottom-six center that can produce. The Philadelphia Flyers and Tampa Bay Lightning are other rumored landing spots for Letestu as well. It’s worth noting Letestu and his family recently bought a home in Ohio. Could Letestu politely ask Chiarelli to make an accommodating trade to a team he’ll likely want to sign with in the summer anyway? Time will tell. 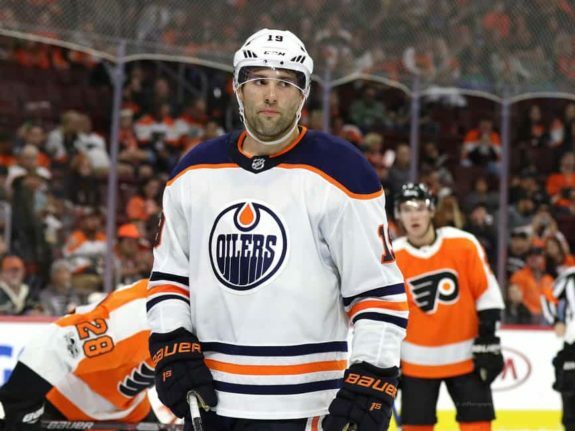 Patrick Maroon: Will He Stay or Will He Go? Oilers head coach Todd McLellan talked about Maroon’s play leading up to the deadline. McLellan believes Maroon’s uncertain future has affected his play recently. The 29-year-old has just one assist in his last four games and only four points in his previous 12 games. He also has just six goals in his last 30 games. Maroon, like Letetsu, is also a pending UFA this summer with an expiring $1.5 million cap hit. Pierre LeBrun stated on TSN Insider Trading that he believes the Oilers could potentially get a late first-round pick for Maroon. LeBrun does speculate that the internal preference for Edmonton might be to get a top prospect. Another preference may be to acquire a player who is close to making an impact and could help the Oilers make a quick turnaround next season. If Maroon were to hit the free agent market, it’s possible he could command $4 million per on a multi-year extension. Andy Strickland of Fox Sports Midwest believes it’s more and more likely Maroon will be traded instead of being re-signed by the Oilers. Although the two sides continue to talk, if it is $4 million or more that Maroon is seeking, Edmonton would be better off dealing the pending UFA. I’d agree with Jim Matheson of the Edmonton Journal; the Oilers need a top line scorer to compliment the likes of Connor McDavid and Leon Draisaitl. There’s no questioning Maroon is talented, but Edmonton needs a more bonafide scorer in their top six. The two sides are still talking and hopeful to hammer out a contract extension, but the possibility of a trade is still quite high. During that same insider trading segment, Darren Dreger mentioned the Boston Bruins and Winnipeg Jets as potential suitors. The Bruins could add some size to their top six, and another possible scoring option as they gear up for a playoff push. If the Jets were able to acquire Maroon, they’d be able to roll three offensive lines and be tough to handle as an opponent come playoff time. THW’s Larry Fisher also adds the St. Louis Blues, and Tampa Bay Lightning as options as well. Building off of LeBrun’s belief that the Oilers could get a first-round pick, Tampa is in that position. They’ve also got the cap space, and prospects to make a move like this. Fisher even proposed a potential trade between Tampa and Edmonton. In his mock trade deadline piece, he threw out a possible deal with Maroon swapping places with Tampa’s Mitchell Stephens. Ironically enough, Stephens was what became of the 2015 33rd overall pick that was traded by Edmonton for Griffin Reinhart. Fisher also lists Anthony Cirelli, Taylor Raddysh, Brett Howden, Matthew Peca, Adam Erne and others as potential targets if Edmonton was looking at a prospect. You also never know if the New York Islanders might be interested. As Rob Tychkowski of the Edmonton Journal points out, Islander scouts were spotted at the Oiler games versus the Vegas Golden Knights and Arizona Coyotes. Matheson believes that the Oilers could also look at the CJ Suess and Mason Appleton from Winnipeg. Those names might not be as seductive as Jack Roslovic or Kristian Vesalainen, but you’d be dreaming if you thought Edmonton could land either of those two. Boston might wield some more exciting names like Peter Cehlarik, Trent Frederic, and Zach Senyshen. What about a hometown reunion with Jake DeBrusk? Again, probably dreaming! Will Oilers Acquire a No.1 Defenseman? Lastly, there’s plenty of talk about the Oilers going out and finding a big-time defenseman. 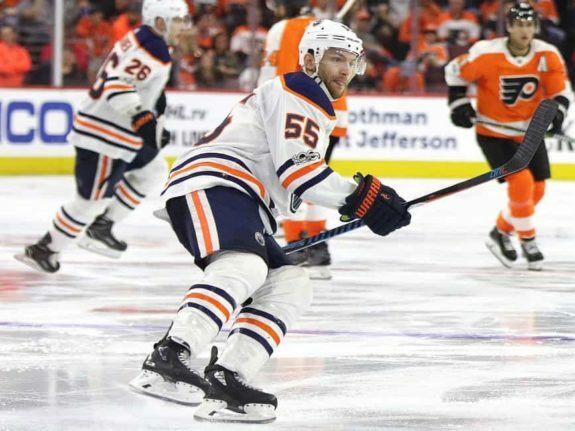 It all started with Oilers CEO Bob Nicholson suggesting in a media availability that if Edmonton could add a top defenseman that they’d be in a better spot. The rumblings have naturally linked the Oilers to the two big defensemen that are possibly on the market; Oliver Ekman-Larsson, and Erik Karlsson. Adding either of the two would be a massive coup for an Edmonton team that doesn’t have a real lynchpin on the backend. Matheson believes the Oilers want Ekman-Larsson in the worst way possible. It’s no secret that Arizona Coyotes GM John Chayka has been trying to re-sign Ekman-Larsson, but he might have a better idea closer to the 2018 NHL Draft in June. 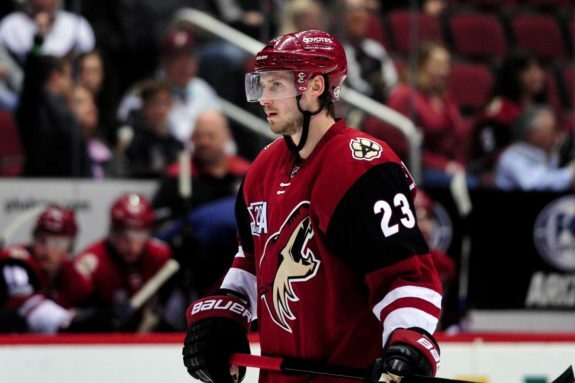 Ekman-Larsson, 26, is signed through next season at $5.5 million, plays the left side, and is a left shot defender. He’s got 30 points in 60 games this year, and averaging 23:58 per night. He’s been an absolute stud for the Coyotes, contributes on both special teams, and would be a huge asset for the Oilers. Karlsson is the other name being thrown around in the rumor mill, but like Ekman-Larsson, this looks like a summer deal. This would be a dream scenario to put arguably the most gifted offensive defenseman in the league with the most skilled offensive forward in the game today. For the realist, it’s a pipe dream scenario, but it’s within the realm of possibility if the Oilers can muster up the assets to make it happen. If the Ottawa Senators are genuinely dealing Karlsson, he’ll be the most sought-after asset in recent history. Like Ekman-Larsson, the 27-year-old will enter the final year of his contract next year. He’s coming off a deal that carries a $6.5 million cap hit and has a modified no-trade clause (NTC). Karlsson can choose ten teams he will not accept a trade to. I wouldn’t expect a big move like this on trade deadline day. If Chiarelli and the Oilers are heading in this direction to make a move like this, maybe they can go out and acquire assets to better position themselves for a move like this. Outside of seeing Maroon and Letestu dealt, expect a quiet deadline from the Oilers. Other moves that might happen are seeing Mike Cammalleri, Yohann Auvitu, and Laurent Brossoit dealt somewhere for lesser assets.